Music stars are paying tribute to singer-songwriter and music executive Tommy Page, who was found dead Friday (March 3) of an apparent suicide. He was 46. Page’s good friend, songwriter Diane Warren, tweeted that she was “devastated” after hearing the tragic news. “Someone I loved so much was the last person U would ever think would do this. Why why why Tommy????? ?” she wrote. Artists Josh Groban and Ashley Tisdale, both of whom Page worked with while he was an executive at Warner Bros./Reprise, also expressed their condolences. "A kind and wonderful man who helped me a lot early on. Helped pick my first singles," Groban tweeted. Page started his career as a recording artist for Sire Records and topped the Billboard Hot 100 with his single, "I'll Be Your Everything" in April 1990. He went on to have a successful career as an executive in the music business, including stints at Warner Bros./Reprise, Billboard, Pandora, and Cumulus Media. 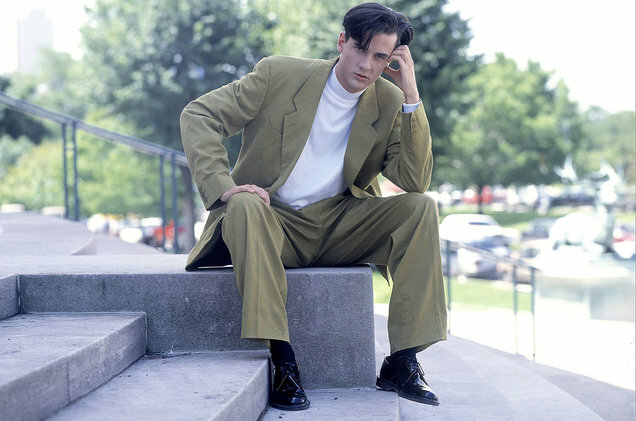 Singer-songwriter and music industry executive Tommy Page, best known for his No. 1 single “I’ll Be Your Everything," was found dead Friday (March 3). The cause of death was unclear at press time, but according to reports from several friends, it was an apparent suicide. He was 46. Page started his career as a recording artist for Sire Records -- as he told it, he was working as a coat-checker at the New York nightclub Nell's and gave his demo to label head Seymour Stein -- and topped the Billboard Hot 100 with his single, "I'll Be Your Everything" in April 1990. The song was written by Page, along with Jordan Knight and Danny Wood of Page's tourmates New Kids on the Block. The group's Donnie Wahlberg, along with Knight, also had a hand in producing the track. Page later returned to NYU's Stern School of Business to pursue his career as a music executive. He recorded nine studio albums and continued to tour throughout his career. "My whole life I dreamed of having a No. 1 record, ever since I could remember getting into music. I wanted to be on top of the Billboard charts," Page remembered in 2011. Page later joined Warner Bros./Reprise Records, where he served as an A&R executive and vice president of top 40 promotion. During that time, he helped shape the careers of many successful artists, including Michael Buble, Alanis Morissette, Josh Groban, David Foster and Green Day. In 2011, Page left Warner Bros./Reprise to join Billboard as associate publisher. The following year he was promoted to publisher. "Ever since childhood, I've had big aspirations for my music career," Page said at the time. "In the inscription below my senior picture in my high school yearbook, I actually wrote 'Billboard charts, here I come!' -- a hopeful pipe dream from an ordinary Jersey kid." In 2013, Page left Billboard to become Pandora's vp of artist and brand partnerships, where his history as a recording artist helped him play a significant role in the company's recent outreach to the artist and music-business community after years of criticism over its royalty rates. In 2015, Page joined Cumulus Media as senior vice president of brand partnerships. Page most recently served as VP of music partnerships at the Village Voice. He continued to record and perform regularly, particularly in Asia. "We are all mourning the loss of our friend and colleague Tommy Page," said Billboard Entertainment Group President John Amato. "He was a magnetic soul and a true entertainer. Our thoughts are with his family." Tommy Page, the pop star-turned-music executive known for the song “I’ll Be Your Everything,” has died. He was 46. Page began his career in the music industry at Sire Records after meeting its founder, Seymour Stein, who helped launched the careers of the Ramones and Madonna. His performing career started after writing the theme for the 1989 comedy “Shag,” and using the title track to launch his debut, self-titled album. But commercial success did not arrive until his follow-up, “Paintings in My Mind” which featured “I’ll Be Your Everything.” The song, written with and featuring New Kids on the Block, would go on to reach No. 1 on the music charts. In 1992, Page made an appearance as himself on an episode of “Full House” titled “Crushed” in which he sang to Stephanie Tanner (Jodie Sweetin) on her tenth birthday. 0 Response to "Music Stars Pay Tribute to Tommy Page on Social Media"